To read this newsletter in an easy .pdf format, click here to download Alkalizing Foods to Prevent Disease. The body is constantly striving toward balance. When we eat, breathe, walk, talk, jog, bend over, laugh, or simply sit and do nothing, the body is at work making hundreds of thousands of adjustments to maintain homeostasis. Our system fine-tunes to keep a host of factors, including body temperature, blood glucose, and the oxygen levels of the blood within safe ranges. For good health, the body must also maintain the blood and extracellular body fluids in a slightly alkaline range, a pH between 7.35 and 7.45, where a pH of 7 is considered neutral. First, we naturally favor acid-forming foods because they taste good to us. Acid-forming foods are generally those that have a sweet or bland taste, such as sugar, refined-flour baked goods, grains, and animal products. In contrast, alkalizing foods tend to be bitter, sour, or pungent, foods like dark leafy greens, lemons, radishes and onions. Our taste preference for sweet is nothing new. Nature programmed us to like “sweet” as a self-protection pointing us to safer foods in the environment, since sweet foods are generally non-poisonous. Second, cheap, convenience foods and fast foods—sugar, refined flour products, and fried foods—which are largely acid-forming, are everywhere. Beyond convenience foods, we must also add the factor lifestyle—our “grab-and-go,” “grab-on-the-go” hurried living undermines home cooking, particularly the preparation of alkalizing foods like dark leafy greens and other plant-based alkalizing foods. Third, because the brain runs on glucose and because our lives are over-filled with stresses and overthinking, we often find ourselves running around on “empty.” When we “hit the wall,” we crave sugar and refined carbohydrates as a stop-gap to stoke and appease our brain cells to keep them working for us despite fatigue and stress. To consume sufficient alkalizing foods in today’s world requires a conscious and conscientious effort. But, once we understand the role that alkalizing foods can play to prevent over-acidic blood conditions, a factor that is linked to chronic disease, it is easier to make such a commitment. Dating back to Ancient Egypt and later Early Greece—well before the days of antibiotics and modern suppressive drugs—good health was based upon a balance of two dualities, intervention and natural healing. Until modern times, doctor and patient worked together, with both playing a vital role in the patient’s healing journey. Today, however, because of the seeming power of modern miracle drugs to address most ills in the short-term, we have largely forgotten the caduceus’ intended message regarding the dual role of patient and practitioner. 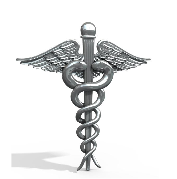 We now take the caduceus simply as the “logo” of modern medicine. Perhaps, the discussion that follows concerning acid/alkaline foods will be an inspiration for us to take back the ball and run with it when there are ways for us to complement modern medicine. There is much we can do to support our own health. Taking action is itself a positive when it empowers. In the end, we control what we eat and how we live, which means that we have the power to prevent our blood and extracellular fluids from being in an over-acidic condition. Bechamp successfully conducted research to support this hypothesis—that preventable disease is the result of diseased tissues, “morbid terrain,” acting as an accommodating host for harmful bacteria and viruses. Bechamp believed that disease springs from an extracellular environment that is acid and oxygen-deficient, something that results from an acid-forming diet and unhealthy lifestyle. Pasteur, a contemporary and 19th century rival of Bechamp, apparently borrowed ideas from Bechamp to develop his “germ” theory, the view that germs “attack” a healthy body to cause disease. Pasteur’s theory triumphed over Bechamp’s. Germ theory was championed by pharmaceutical companies who could reap profits by creating patented synthetic drugs to fight germs. Germ theory also appealed to the medical profession (and perhaps the public, too) because it assigned an active role to doctors in being able to point to and fight a specific enemy—germs—while it allowed patients to relinquish/sidestep responsibility for their own health. While Bechamp’s theories—self-help strategies involving alkalizing foods and a healthy lifestyle—were never the kind to gain the support of moneyed constituencies and mainstream thinking (since fruits and vegetables cannot be patented to reap profits like synthetic drugs), Bechamp’s ideas still have value. 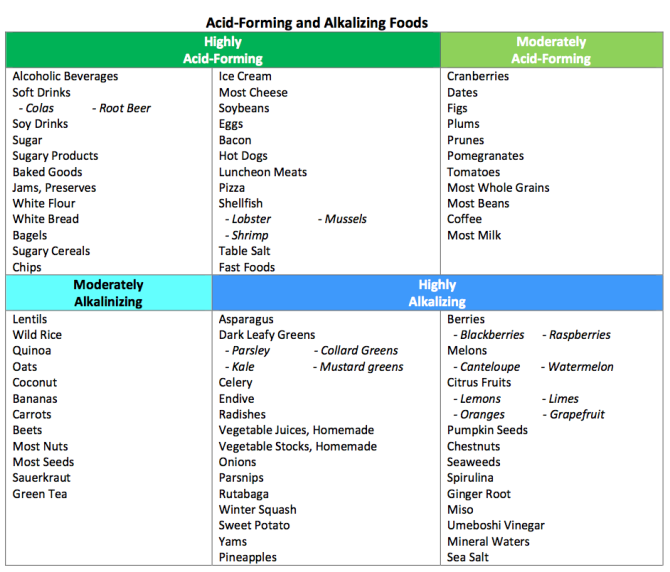 As we explore acid-/alkaline-forming foods in the discussion that follows, let’s hold in our mind the concept of “milieu interieur,” and the potential positives that foods and lifestyle can have in helping us maintain a healthy acid/alkaline balance throughout. Water is a powerful solvent; it can take into it most minerals essential to life—think, for example, of the many minerals and trace minerals, some 80 now known, contained in sea water. One of the chief characteristics of water is ionization. Water holds atoms in suspension and facilitates chemical reactions whereby ions, atoms that have an unequal number of protons and electrons, seek stability by exchanging electrons, either stealing from or donating to a neighbor. What is pH? Measures of pH are based on the acidity or alkalinity of fluids. Acids are chemical compounds containing an excess of hydrogen ions with the ability to donate positively charged hydrogen ions (H+) to a chemical reaction. Alkalis (bases), in contrast, hold a surplus of hydroxyl ions (OH-) and stand ready to donate electrons; thus, they are able to neutralize acid solutions and acidic conditions. When alkalis relinquish electrons, acids that can be harmful to the body, particularly the kidneys, liver, and large intestine are neutralized: alkalis (carbonic salts in form of the mineral compounds sodium, calcium, potassium, magnesium) join with acids (usually sulfuric, phosphoric, acetic, lactic) to transform corrosive elements into benign water, carbon dioxide, and neutral salts. Measuring pH. The acidity or alkalinity of a solution is measured by pH, an exponential calibration, and a term that by convention is based on the number of hydrogen ions (H+) in solution, although in any solution, hydroxyl ions (HO-) are also present. For example, water in an ideal state is neutral with a pH of 7, indicating that it contains an equal number of hydrogen and hydroxyl ions. A reading below pH 7 indicates a greater concentration of hydrogen ions relative to hydroxyl ions; for any reading above pH 7, the opposite is true. In reality, any solution contains both hydrogen and hydroxyl ions. Whether we label a solution acid or alkaline is really a relative concept, determined by which set of ions, H+ or HO-, has the upper hand. As an ideal, a pH of 7 indicates that in distilled water held at 22 C degrees, there is one gram of hydrogen ions (H+) as well as one gram of hydroxyl ions (OH-) for every 10,000,000 liters of water: the hydrogen concentration is one ten-millionth or 1/10,000,000, or 10 to the negative 7th power, a pH of 7. Similarly, pH 6 would indicate one gram of hydrogen ions for every 1,000,000 liters of water, and so on, following exponentially. As indicated by the Acid/Alkaline chart above, stomach acid has a pH of around 1.5. It is highly corrosive, with a heavy concentration of hydrogen scavenger ions relative to hydroxyl donors. Its 1.5 pH means that it has a powerful 1.5 grams of H+ per 10 liters of water. Moving up the pH scale, hydroxyl ions (H0-) begin to dominate. At pH 12, hydrogen ions are greatly diluted, with only one gram of hydrogen ions to 1,000,000,000,000 liters of water. What we want to remember is that alkalis help neutralize corrosive acids that are created by exercise or when the body metabolizes acid-forming foods. Alkalis turn toxic body wastes into harmless H2O + CO2 + Neutral Salts so that they can be safely excreted. The body will do this, using either the minerals we supply to it by deep breathing or the alkalizing foods that we eat every day, or by tapping into our body’s minerals stores. The latter results in an over-acidic condition that can with time foster chronic diseases like osteoporosis, inflammation, and cancer. How pH can help guide our food choices. We don’t have to understand the intricacies of pH as along as we roughly understand the difference between acid-forming and alkalizing foods. Yet, this itself is tricky: acid tasting foods like limes are, in fact, highly alkalizing to the body. This is because, when metabolized, they leave behind a mineral residue that is alkalizing; the body can then use these minerals to neutralize acids. Likewise, bland/sweet foods that do not taste acidic, like grains, proteins and sugars, tend to be highly acid-forming because they contain sulfur and phosphorus and leave end products sulfuric and phosphoric acids that must neutralized by minerals before they can be safely expelled. Fruits and vegetables, rich in minerals, as alkalizing foods. Fruits and vegetables are alkalizing because their organic acids contain minerals like potassium, sodium, calcium, and magnesium. When their organic acids are oxidized, they are converted to carbon dioxide and water and leave behind alkalizing elements, such as Na, K, Ca, and Mg. The body can then use these to help neutralize acid-forming foods, like sugar, animal products, and refined grains. Proteins and grains, high in sulfur and phosphorus, as acid-forming foods. As noted above, most protein foods and grains are acid-forming because they contain phosphorus and sulfur, which when metabolized produce phosphoric acid and sulfuric acid. Fats and carbohydrates produce acetic and lactic acids. These acids are also toxic and need to be neutralized (converted to carbon dioxide, water, and neutral salts) before they can be excreted by the kidneys and/or the large intestine. pH and physical activity and respiration. Apart from food, our daily activity also influences the pH of our blood and extracellular fluids. Exercise creates the end products lactic acid and carbon dioxide (carbonic acid), acidic conditions in the blood and body fluids. Exercise, therefore, also demands alkalizing foods—fruits and vegetables—that are rich sources of Na, Ca, Mg, and K to help neutralize these acids. An athlete will require more alkalizing foods than someone who is more sedentary. Deep and prolonged breathing is also a good way to alkalize the body: Deep breathing reduces the carbon dioxide in the lungs. The lungs then pull carbon dioxide from the blood, thus helping to alkalize the system. The deep breathing that we naturally do in vigorous exercise provides some alkalizing offset to the acid condition caused by exercise. How do you know if your system is over-acidic? You can purchase litmus paper, available at most drug stores, and test your saliva upon waking, but the easiest way is simply to pay attention to how your mouth feels, especially when you first wake in the morning. If you wake with a sour, dry, “cotton” mouth, take this as a sign of over-acidity. We easily feel this way after late-night partying. Shrimp, steak, and alcohol are highly acid-forming foods, which is why we naturally head for a tall, alkalizing glass of orange juice the morning following a long night out. Or, why bacon and eggs (acid-forming) demand orange juice; and why eggs and steak (acid-forming) demand alkalizing seasalt (see table above). 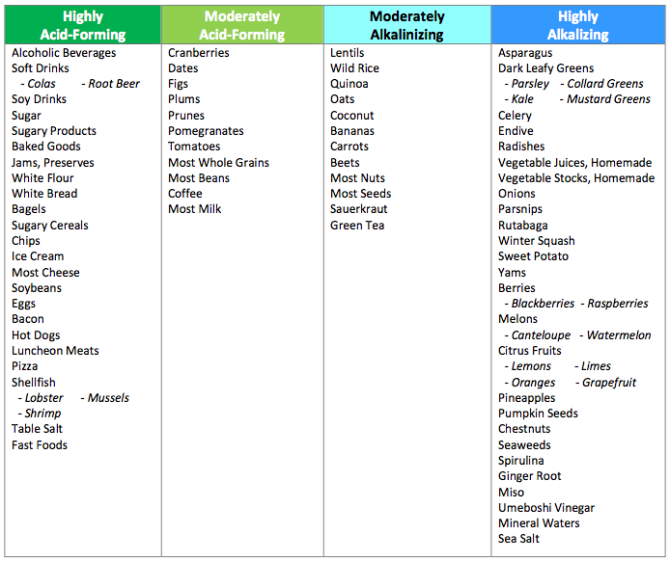 Balancing acid/alkaline to meet your personal requirements. As noted above, people who exercise vigorously require more alkalizing foods than individuals who are more sedentary. An Olympic athlete in training might require a ratio of alkalizing:acid-forming foods of perhaps 4:1. The same might be true of someone fighting cancer or other chronic disease conditions. For many people who are generally healthy and moderately active, a reasonable ratio might be closer to 2:1 or even parity. These are particularly helpful for people suffering from cancer and joint issues, and other chronic conditions that are linked to over-acidic blood conditions. Bieler broth is a wonderful, nurturing and calming food that has been used by holistic doctors for fasting. It helps to nourish and de-acidify the system and can be enjoyed in limitless amounts. Place vegetables in a steaming basket and cover the pot with enough water so that it does not boil dry, but not enough to cover any of the vegetables. Bring water to a boil, then turn down the heat to a simmer. Check vegetables with a fork periodically to be sure that they are still “crunchy.” Steaming will take a few minutes. Place vegetables and the steaming water into a blender and puree. Add any favorite fresh or dried herbs to enhance the flavor of the broth. Or, if you have a sensitive digestive system and do better with foods that are well-cooked, place the above fresh vegetables in a soup pot with a significant amount of water. Add any of your favorite fresh or dried herbs to enhance the flavor of your soup. Bring this to a boil, then turn down the heat and allow to simmer for 40-60 minutes. Drain and keep the broth, discarding the vegetables, which have lost their nutrients to the broth. Store broth in the refrigerator 2-3 days or freeze it for later use. This recipe can be made in a slow cooker. It is an excellent diuretic. The vegetables can also be eaten. Cover vegetables with water and cook until the broth has a rich flavor. Strain and drink hot or cold. Fluids become exponentially reactive and corrosive as pH numbers become smaller. Fluids become increasingly alkaline as pH values rise above pH 7, which is neutral. Reactive hydrogen ions are increasingly diluted and outnumbered by hydroxyl electron donor ions.